Less and less of these iconic cones are seen outside the corner store. Postcards, beer, ice-cream, bread, cleaners and more. All those handy things if you just pop down the street. My favorites are the giant 99 ice cream cones you sometimes see, especially outside tea rooms and shops in touristy villages and seaside resorts. Something about a three foot Cadbury flake really tickles me. I'd be attracted by these giant ice cream cones! That totally gave me an ice cream craving!!! Have never seen cones like these - I think they would make me run the other way. I could go for one of those today! 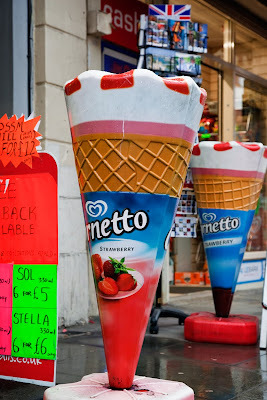 I don't remember seeing big Cornettos like these over here. I could really use an "after school treat" right now! Time to drive home from work!